Pigs, cows, and chickens are individuals with feelings - they can feel love, happiness, loneliness, and fear, just as dogs, cats, and people do. The purpose of factory farms is to produce the most meat, milk, and eggs using the least amount of space, time, and money. The animals suffer the consequences of these shortcuts. They are never allowed to do anything that is natural to them - they are never able to feel the grass beneath their feet, the sun on their faces, or fresh air. They endure mutilation - chicks have their beaks burned off, cows and pigs are castrated without anesthesia, cows are dehorned and branded, and the list goes on - all without any painkillers. Some animals, such as veal calves, are kept in lonely isolation, while others, such as chickens, are crowded so closely together that they can barely move. 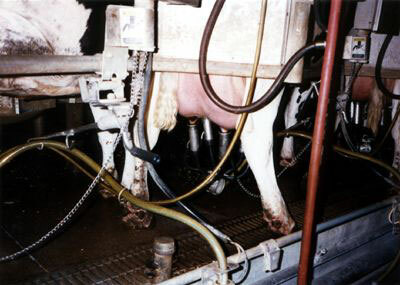 Factory farmers restrict animals' movement, not only to save space, but also so that all their energy goes toward producing flesh, eggs, or milk for human consumption. 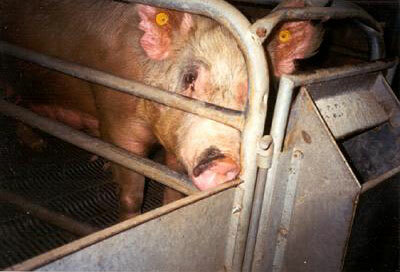 They spend their lives confined to concrete stalls and metal cages, terrified and suffering in such unnatural conditions. Their fear and pain end only after they have been driven, without food or water and often in extreme weather, to the mechanized murder of today's slaughterhouse, where millions each year are skinned and dismembered while still conscious.